Waterbuck Kobus ellipsiprymnus, one of biggest antelopes on Lolldaiga Hills Ranch (Laikipia County, central Kenya), are found throughout the Ranch but prefer the higher grasslands and vegetation along the streams and dams of central and south Lolldaiga. Waterbucks are, as their name indicates, highly water-depended. They are limited in their ability to conserve water and are unable to endure dry periods in hot environments. Two Waterbuck taxa occur in Kenya: Defassa Waterbuck Kobus (ellipsiprymnus) defassa and Common (or Ellipsen) Waterbuck Kobus (ellipsiprymnus) ellipsiprymnus. Their taxonomic arrangement is debated; some authors (e.g., Lorenzen et al. 2006, Spinage 2013, Kingdon 1982, 2015) treat these taxa as subspecies, while others (e.g, Stewart & Stewart 1963, Groves & Grubb 2011) consider them species. 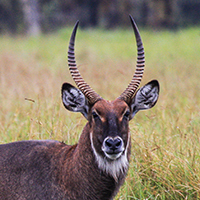 Generally, Defassa Waterbuck occur in Kenya and Tanzania west of the Eastern Rift Valley, and Common Waterbuck east of the Rift. Their ranges overlap in north Tanzania (e.g., Lake Manyara) and in south and central Kenya (Stewart & Stewart 1963, Lorenzen et al. 2006, Spinage 2013). Defassa Waterbuck occur on Lolldaiga Hills Ranch while Common Waterbuck are present ca. 50 km to the northeast in Samburu National Reserve and ca. 100 km to the east in Meru National Park. 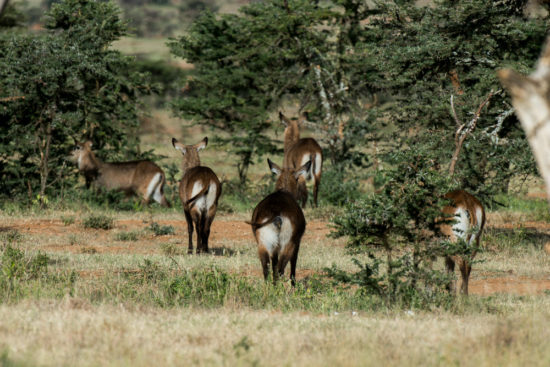 It is not known where Defassa Waterbuck gives way to Common Waterbuck in this region, or whether Common Waterbuck are present in Laikipia County. Defassa Waterbuck Kobus (ellipsiprymnus) defassa, Lolldaiga Hills Ranch. Photograph by Paul Benson. Adult male Common Waterbuck Kobus (ellipsiprymnus) ellipsiprymnus, Samburu National Reserve, central Kenya. Photograph by Yvonne de Jong and Tom Butynski. 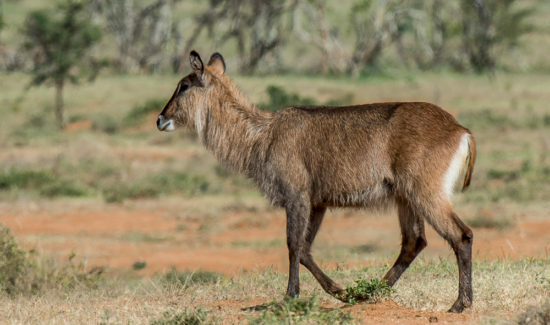 The two (sub)species of Waterbuck are similar in appearance. 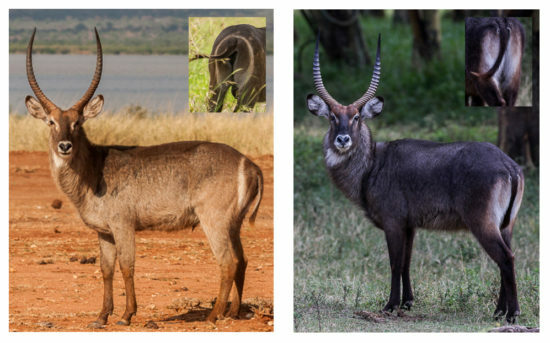 The main distinguishing character in the field is the colour pattern on the rump; Common Waterbuck have a distinct white ellipse (or crescent) around the rump, whereas Defassa Waterbuck have a wholly white (or whitish) rump. Here we use the rump as the primary phenotypic indicator to distinguish the two taxa. 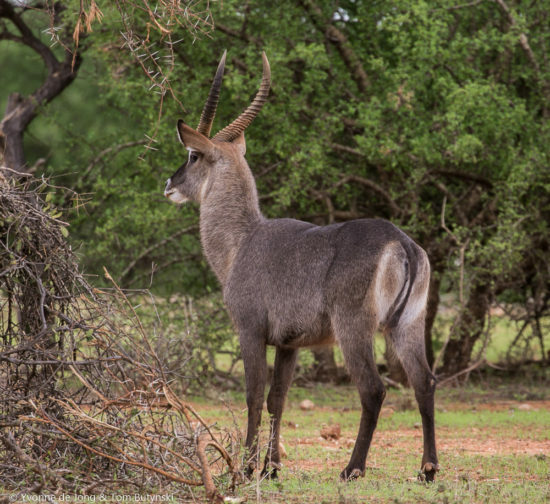 The colour pattern on the rump is the main trait by which the two taxa of Waterbuck are distinguished in the field. Left: Adult male Common (or Ellipsen) Waterbuck Kobus (ellipsiprymnus) ellipsiprymnus. Right: Adult male Defassa Waterbuck Kobus (ellipsiprymnus) defassa. All four photographs by Yvonne de Jong and Tom Butynski in Kenya. During a primate and warthog survey in 2016 in north and east Laikipia County, west Isiolo County, and south Samburu County, locality information and photographs were obtained of all Waterbuck herds encountered. To better understand the geographic limits of Defassa Waterbuck and Common Waterbuck, the photographs (together with photographs obtained during several previous surveys), were geotagged and published on a Photographic Map (available at: http://www.wildsolutions.nl/photomaps/kobus/). During these surveys, only Defassa Waterbuck were encountered in Laikipia. Previous records of Waterbuck in Laikipia, as well as records on iNaturalist.com (11 records as of June 2017), are all of Defassa Waterbuck. It appears that Common Waterbuck are absent from Laikipia County. We did not, however, encounter Waterbuck in extreme northeast Laikipia (Lekurruki Conservancy and Il’Ngwesi Conservancy) just south of Samburu National Reserve, which is that part of Laikipia where we most expect to find Common Waterbuck. 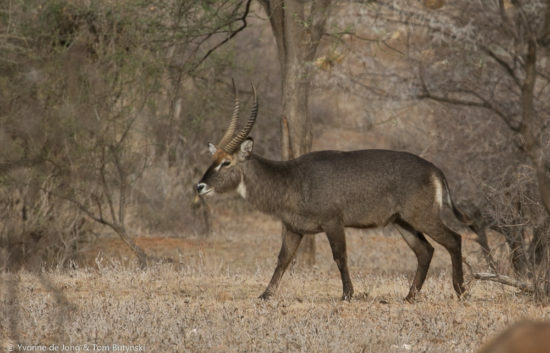 In Samburu National Reserve, we observed Common Waterbuck. Here two adult male Waterbuck were encountered that were phenotypically intermediate between Common Waterbuck and Defassa Waterbuck; one was in Samburu National Reserve and one was just to the west in southeast West Gate Conservancy. Phenotypically intermediate adult male Waterbuck Kobus ellipsiprymnus, southeast West Gate Conservancy, central Kenya. Photograph by Yvonne de Jong and Tom Butynski. Stewart and Stewart (1963), Kingdon (1982), Lorenzen et al. (2006), Groves and Grubb (2011), Spinage (2013), and Foley et al. (2014) refer to a Waterbuck hybrid (or ‘intermediate’) zones for East Africa–reporting phenotypically intermediate individuals in several areas, including along the North Ewaso Nyiro River (e.g., Samburu National Reserve), Athi River (e.g., Nairobi National Park), South Ewaso Nyiro River, and Lake Manyara. In their molecular study, Lorenzen et al. (2006) suggest that “…hybridization was probably very recent, perhaps within the past few centuries — or perhaps it is still undergoing.” According to Spinage (2013), zones of intermediate-patterned Waterbucks are narrow–possibly due to reduced fertility of hybrids. Phenotypically intermediate adult male Waterbuck Kobus ellipsiprymnus, Samburu National Reserve, central Kenya. Photograph by Yvonne de Jong and Tom Butynski. Our preliminary findings indicate that the zone for intermediate-patterned Defassa Waterbuck and Common Waterbuck in central Kenya is, indeed, narrow and lies in south Samburu County, probably extending southward across the North Ewaso Nyiro River into west Isiolo County and, perhaps, into extreme north and/or northeast Laikipia County and the Nyambeni Range. 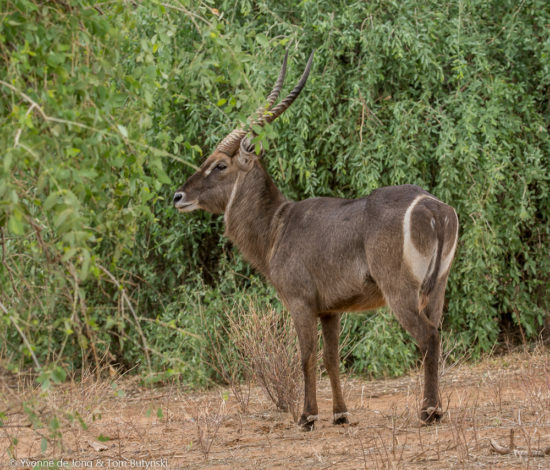 To clarify the geographic limits of this intermediate-zone, we are in particular need of photographs of Waterbuck from south Samburu County (e.g., West Gate Conservancy, Shaba National Reserve, Meibae Conservancy), west Isiolo County (e.g., Mpus Kutuk Conservancy, Ol Donyiro Conservancy, Longopito area), north and northeast Laikipia County (e.g., Lekurruki Conservancy and Il’Ngwesi Conservancy), and Nyambeni Range. If you have photographs of Waterbuck from these regions, please share them with us. Photographs can be sent to Yvonne de Jong at: yvonne@lolldaiga.com Thank you! Reference: Foley et al. 2014. A Field Guide to the Larger Mammals of Tanzania. Princeton University Press, Princeton, NJ; Groves, C. and Grubb, P. 2011. Ungulate Taxonomy. The Johns Hopkins University Press, Baltimore, MD; Kingdon, J. 1982. 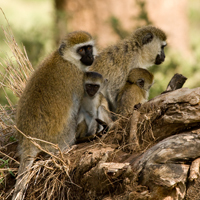 East African Mammals: An Atlas of Evolutions in Africa. Vol. III, Part C: Bovids. Academic Press, London. Kingdon, J. 2015. The Kingdon Field Guide to African Mammals. Bloomsbury, London; Lorenzen, E. D., Simonsen, B.T., Kat, P. W., Arctander, P. and Siegismund, H. R. 2006. Hybridization between subspecies of waterbuck (Kobus ellipsiprymnus) in zones of overlap with limited introgression. Molecular Ecology 15: 3787–3799; Spinage, C. A. 2013. Kobus ellipsiprymnus waterbuck. In: J. Kingdon and M. Hoffmann (eds.). Mammals of Africa, Volume 6: Pigs, Hippopotamuses, Chevro­tain, Giraffes, Deer and Bovids, pp. 461–468. Bloomsbury, London; Stewart, D. R. M. and Stewart, J. 1963. The distribution of some large mammals in Kenya. Journal of the East African Natural History Society and Coryndon Museum 24: 1–52.